Teri: What machine are you stitching on? Elizabeth: I stitch on a Bernina 770QE. It’s the third Bernina I’ve owned. Bernina makes the best sewing machines. I used to work at a Bernina dealer, but now that I no longer work there I still believe and stand by everything I ever said to customers as a salesperson. They are the best sewing machines made. No kidding. If you are passionate about sewing or quilting, you absolutely should sew on a Bernina. I also own a B330, which I use for travel. It’s a handy machine light and easy to lug around. I also still own my almost 30-year-old Bernina 1530. It’s my previous work-horse machine. I know it so well that it feels like an extension of my hands. I ought to pass it on to someone who could use it (since Bernina machine seem to live forever), but I just can’t see to part with it. The B770QE has become my new main squeeze. To say that I adore her is probably a gross understatement. I looooooove her. Her large free arm area is probably what first attracted me to her because it makes maneuvering a quilt so easy, but as we got to know each other over the past two years, I’ve realized that she has many other features that have endeared her to me. A nine millimeter wide stitch is truly awesome for free motion satin stitching around appliqué shapes, and the built-in dual feed is amazing. I’m completely obsessed with her. Or deeply in love. Sometimes it’s hard to tell the difference, you know? Teri: Do you use a long arm or a home machine for quilting? Elizabeth: I free motion quilt on my domestic machine. It is, without a doubt, my favorite thing to do. I’d rather free motion quilt than eat ice cream. For me, that’s saying quite a bit. While free motioning, there is a sense of freedom and excitement that comes from being able to form any design that pops into my head. I don’t think I’ve experienced that during any other activity. To me, it is pure joy. Teri: Do you ever do handwork? Elizabeth: I do handwork occasionally, but I spend much more time at my machine. Recently, while watching television in the evening, I have been hand embroidering sweet little daisies on a damaged sweater that my niece asked me to repair for her. I’m sure she expected me to just patch up the little hole, but once I began embroidering I couldn’t seem to make myself stop. I’m a little bit worried about her reaction to it, actually . . . she’s not exactly the girl-y type in her clothing choices, and here I’m embroidering sweet little daisies . . . well, perhaps she won’t ask me to mend any more of her clothes? Teri: What is your favorite ice cream? Elizabeth: This question is so easy! Cherry Vanilla, hand-made by the best ice cream place EVER — Snowflake Ice Cream Shoppe in Riverhead, NY, located on the east end of Long Island. It’s a creamy, smooth, luscious vanilla with huge, delicious, whole, juicy, locally grown black cherries mixed in — lots of them. It’s been my favorite ice cream since I was a little girl when I used to dribble it down my shirt as I licked it from the cone in Snowflake’s parking lot after a day spent on the beach or U-picking strawberries out in the fields. There are some really great childhood memories connected to that ice cream! My second-favorite flavor is Cannoli. It’s an outrageously delicious, with little pieces of crunchy cannoli shells and tiny chocolate chips mixed into a creamy, decadent cannoli ice cream. Pure heaven. Even the New York Times thinks so. Teri: When did you start quilting? Elizabeth: In 1990 I signed up for a learn-to-quilt class that was offered through my local library. I didn’t know a thing about quilting, but I’d been sewing since I was a little girl, and had always loved making all sorts of things with my hands. Shrinky Dinks, Paint-by-number on black velvet, and notebooks filled with examples of Spirograph designs come to mind when I think back to my childhood years. Anyway, that quilting class was being offered in the evenings, when my husband would be home to take care of my two little boys, and it lasted for six weeks. Looking back, I think my real reason for taking the class was to spend some time out of the house with adults! Teri: Can you tell us a little bit about your quilting journey? Elizabeth: That class was the beginning of my journey. Two lovely elderly women ran the class, and they taught old-school techniques, i.e., cardboard templates, hand-piecing, thread basting, and hand quilting. I longed for my sewing machine during those classes, but today I’m glad I learned the “old” way first. It made me better appreciate the quick, time-saving methods we use today. And it’s always good to have a firm foundation when learning anything new. By the sixth class I had joined the local guild, figured out how to do all of the piecing, appliqué and quilting on my beginner’s sampler with my sewing machine. I quickly discovered the local quilt shop where I began procuring my fabric stash. I later worked at the quilt shop, teaching advanced machine technique classes for seven years. And that was just the beginning of my journey. 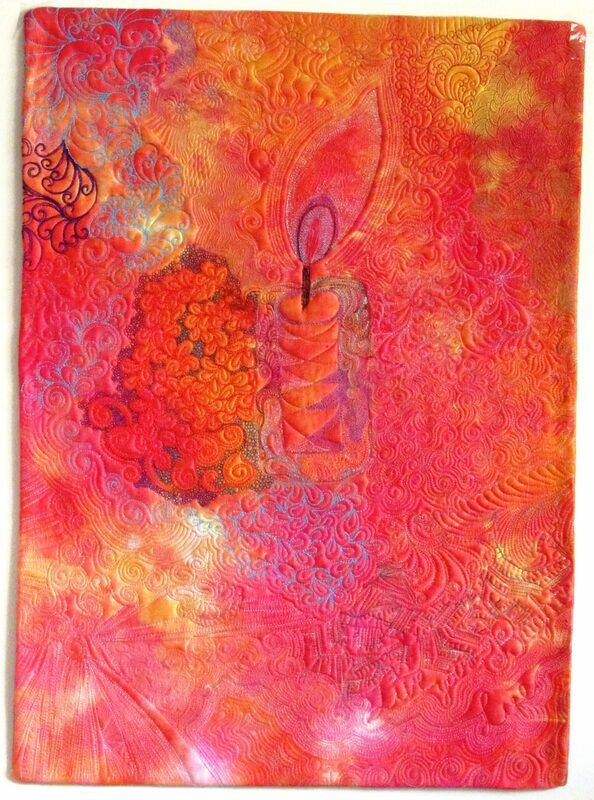 When I discovered art quilting, there was no stopping me. By the end of those seven years, I was giving lectures and workshops to guilds in the mid-Atlantic and the Northeast. At one of those lectures, my first quilting teachers surprised me by sitting in the first row, grinning from ear to ear with pride as I spoke and showed my quilts. I’ve produced quilts in several series over the years (oh my goodness, it’s getting close to 30 years!) ranging from the Goddess Project Quilts to The Rock Art Quilts to the Venetian Lace quits. There have been other quilts in between, but I do prefer working in a series. it’s nice to be able to try new ways to express a similar theme without having to reinvent the wheel with each quilt. Exploring a theme fully can be very gratifying, and often leads to new and surprising roads. Teri: What is your favorite piecing technique? Elizabeth: I’ll share with you my deep, dark secret… I don’t really like to piece. If I have to pick a technique, I’d choose paper piecing, since it’s so precise and easy that it kind of feels like cheating. Teri: What type of foot do you use for machine quilting? Elizabeth: On my BERNINA, I prefer the old standard, a number 9 closed darning foot. It suits me. Teri: Do you have favorite threads or batting? Teri: What do you sip while quilting? Elizabeth: I live on the north fork of Long Island, right down the street from my favorite tasting room. I have to say that the pinot grigio produced at Macari Vineyard is a very fine wine indeed. There’s also a fantastic taco place a mile away from my home that serves the best margarita I have ever had the pleasure of tasting. Most of the time, though, I sip seltzer as I quilt. Seltzer doesn’t stain fabric, which to a quilter, is of great importance. Teri: Do you always use commercially printed/sourced fabric in your designs? Elizabeth: No, not always. I use whatever fabric speaks to me at the time I’m choosing it. I did some fabric dying with friends some time ago and I like to sprinkle that into my quilts. And I have “painted” with markers on solid fabric and used fabric paint stamped onto solid fabric to get just the effect I want. Teri: What fusible do you use in your applique? Elizabeth: I’ve always used Pellon’s Wonder-Under. Because I’ve used it for so long, I know exactly what to expect from it, and so there are never any surprises. I purchase it by the bolt. Teri: Can you tell us a little bit about your new venture in quilt making? Elizabeth: My newest venture in the world of quilting is the launch of my new business, The Quilt Whisperer. I plan to offer my quilting expertise to students in the form of private and group lessons, in my home or theirs. And I’ll be offering my lectures and workshops to guilds, too. I like traveling, and meeting new people, especially quilters, is so fun! I’ve been working hard on developing a website and a facebook page to get the word out. As well as lessons, I’ll be arranging retreats in the area. There are many splendid places here on the beautiful east end of Long Island that would make for a fantastic quilting get-away, maybe with some side trips to a tasting room at one of the local vineyards or a leisurely walk on the beach, or a dip in a salt-water pool, etc. . . . Thank you Elizabeth. I admire you so very much. Awe. . .what a wonderfully done interview! I thoroughly enjoyed reading every word! I wish Elizabeth well on the next part of her journey! Thank you for the encouragement, Terry! Thanks for the very enjoyable interview, Teri. It was such fun to answer your great questions (especially about ice cream!). Can’t wait to see who you interview next!